The Pines at Bragg Creek is the Foothills newest lifestyle enclave, nestled in the heart of beautiful Bragg Creek at Wintergreen Golf & Country Club. Set in nature, yet conveniently close to the vibrant city of Calgary, you'll have the best of both worlds with the quiet mountain way of life at your doorstep and the city life just a few minutes down the highway. 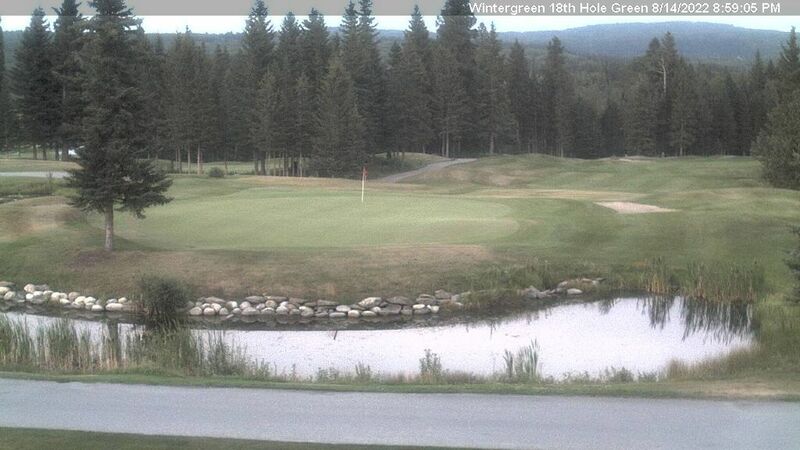 We invite you to read about the ongoing development at Wintergreen Golf & Country Club below and to sign up for our email list for further information including community meeting scheduling, just email the contact at the bottom of the page. Many community members expressed a desire to see the golf course maintained in its current form and functions. To accommodate and ensure this, a Direct Control district was established that allows only for a golf course and related uses in its existing location. Concern was expressed by neighbours about the interface of proposed and existing lots, specifically regarding the density of development on the North side of the property. This influenced the transitioning of densities and resulted in single detached lots on the northern side of the development, rather than the originally proposed semi-detached dwellings. Residents suggested limiting the size of the proposed commercial to ensure that it would not compete with the Hamlet, which has been included in both the Conceptual Scheme and the proposed zoning bylaw. Community members identified a gap in the tourism market, noting that short-term lodging options were very limited in the area. This led to the incorporation of provisions for a hotel in the Conceptual Scheme policy and bylaw. Our applications will now be reviewed and considered by Rocky View County Administration and distributed to external agencies for comment. This process takes time and there may be changes to our plans based on their feedback – we will share these changes with you as they are made. Rocky View County will request feedback from the public, as well as hold a public hearing allowing Council to hear from anyone wishing to express their opinion on the project. We continue to welcome discussion and questions relating to the proposed redevelopment. Please do not hesitate to keep in touch. Below, please find links to our Conceptual Scheme and proposed land use that were submitted on June 4, 2015. Since it’s opening as Lyon Mountain Ski Hill in 1982, the site has served as a key amenity to the community. The ski hill was originally constructed by Bob Lyon, sold to the Skiing Louise Group, and eventually purchased by Resorts of the Canadian Rockies Inc. Under the new ownership, an evaluation was performed on the ski hill and due to market conditions, aging infrastructure and a lack of reinvestment, the decision was made to close the ski hill in 2003. Since that time the ski hill lands have remained idle with the main focus being placed on operating and improving the golf course known as Wintergreen Golf and Country Club. For years following the closure of the ski hill, there was little onsite activity. During this time, many of the ski lifts were removed and infrastructure secured. In 2011, work began on a conceptual idea to redevelop the lands into a residential community. This project, currently still in its infancy, anticipates the creation of approximately 200-300 housing units of varying density. Timeframe of build out will be determined by market conditions. 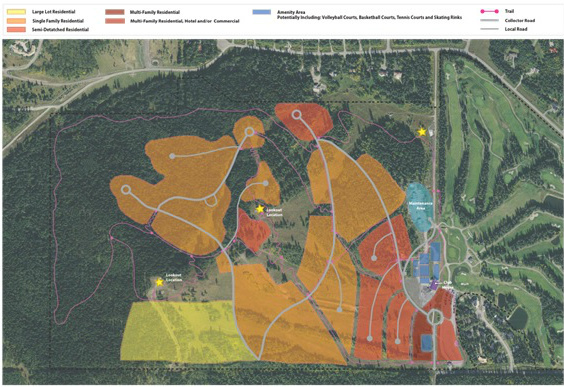 With the completion of initial environmental assessments in 2012, a conceptual layout (fig.2) was produced and presented to the community. Working toward the long-term goal of developing the conceptual layout into an official scheme, additional assessments and further consultation are currently underway and will need to be complete before submitting an application for land use (fig.3). Integral to the success of the development meeting the needs of the community, stakeholder engagement will be ongoing throughout the planning stages. Through initial stakeholder engagement, ideas for planning have been collected in addition to themes around benefits and careful consideration. A neighbouring member of the area for many years, RCR remains dedicated to preserving Bragg Creek as a thriving four season community, and to ensuring that any development is tailored to match the local character of the area. In the coming months, the plan will evolve as more input is received from the community and identified stakeholders. A draft plan will be back in front of the community in the Fall of this year. We look forward to another meeting to review the draft prior to submission of the Conceptual Scheme and Land Use Redesignation (rezoning) applications to Rocky View County. The Conceptual Scheme and Land Use Redesignation (rezoning) application will be submitted concurrently, which will provide guidance for the development and list of uses and restrictions for the property. It typically takes approximately 9 months for RVC to process these applications and a public hearing will be held by Council to inform their decision. An analysis of water and wastewater requirements is required for the site. A review on the water requirements will be completed in collaboration with Wintergreen Woods Water Utility. The intent is to amend an existing snowmaking license for domestic use and receive treated water. The wastewater treatment facility onsite currently services the golf course and the 14 lot subdivision constructed in 1999. Though there is some capacity in this system to provide service for the first few phases of development, the long-term goal is to tie into the newly constructed RVC wastewater treatment plant.